Catalign Innovation Consulting: How to build curiosity stamina? How to build curiosity stamina? Stefan Hawking, the famous Physicist, in his first Facebook update in October said, “Be curious. I know I will always be.” That’s not very different from what Einstein said, “I have no special talent. I am only passionately curious.” Most of us may not be passionately curious about anything. Is there a way one can build curiosity stamina systematically? Let’s explore it in this article. Many times we confuse curiosity stamina with what kids demonstrate. They keep asking “Why?” questions one after the other. That is a useful start. However, that is not an indicator of curiosity stamina. Jamsetji Tata took a soil sample near Nagpur for testing in 1882. He wanted to check if the soil is right for steel production. The result was negative. He continued to perform such tests whenever a soil showed promise and kept a journal to keep track of the results. For how long? 17 years! That’s curiosity stamina. It is remaining curious around a single question or a topic for sufficiently long time. Not jumping from one question to another question from moment-to-moment. Ask yourself – how long do I remain curious around one topic? For most of us, the topic is over once a quick-fix is given. · Andrew Wiles: Remained curious about Fermat’s Last Theorem for more than two decades before committing to the problem for another decade. (See the story). 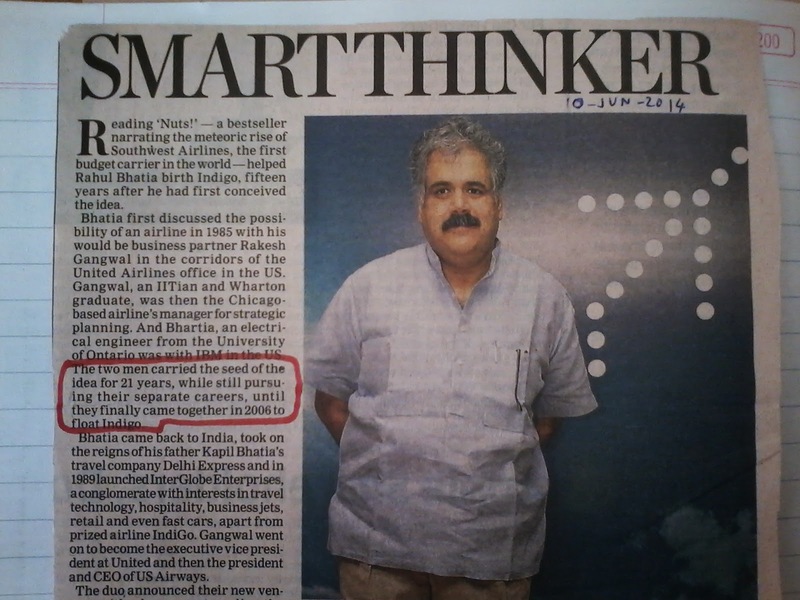 · Rahul Bhatia: Remained curious about starting an airline in India for more than two decades before starting Indigo. He and his friend Rakesh Gangwal first discussed the possibility in 1985. Start a curiosity diary: One way to get started is to maintain a curiosity diary. That is what I do. It contains links to articles or newspaper cuttings which have aroused my curiosity. For example, see the clipping of the Rahul Bhatia article and highlighting of the part that made me curious. Most of the themes will be forgotten over time. Some themes will recur mostly because they resonate deeply within. They are good candidates to pursue further. Identify the core challenge: Frame the challenge differently. For example, see “5 ways of framing a challenge”. Ask, “Why is the problem not solved yet?” See how others have tackled the challenge. Ask, “Can I make progress here?” Andrew Wiles was suggested not to work on the Fermat’s Last Theorem for his PhD because he was told, “You could spend years getting nowhere”. It is only after a new mathematical result was published in 1986 which suddenly created new hope for proving Fermat’s Last Theorem. The new result had created a linkage between Fermat’s Last Theorem and an area in which Andrew was already a known expert (called elliptical curves). It meant chances of progress were now higher. Perform low-cost experiments: Prototyping is a great way to get to know an area. It tells you whether some aspect of an idea works and it also demonstrates whether you have the skills to make progress. It allows you to get quick feedback. You may want to try what others have already tried, just to make sure it doesn't work. Don’t forget to re-frame the challenge as you learn new things. Look for collaborators: Many times things don’t work out the way we would have imagined. Pressure from your day-job mounts and you really feel drained. Where do you get your energy from? In such situations, it helps to have a buddy who shares your passion. It is not easy to find one. However, you increase your chances of finding one if you socialize your idea. Write a blog / paper, join a community / forum and share your thoughts / challenge / ideas. You never know from where your collaborator may come from. These are a few things I do to keep my curiosity alive. Perhaps you may have your own ways. Please feel free to share your thoughts. Nice post and pertinent advice for fostering curiosity for all ages. Very good idea. Badly need your services. Thanks. Sorry, I am Bangalore based.